FamilySearch is constantly adding searchable records. I tested their records for Cook County, Illinois. I note you cannot right click and save a section but if you have Windows 7 you can use the snipping tool. If you hover over a name you get more information, perhaps spouse, parents and/or children. And if it is a vital record you can order a copy from the Cook County Clerk. It produced assorted birth, death and immigration records for the surname. I note they have not done a bang up job with the ethnic names or the foreign birthplaces so you need to be flexible. Needless to say, the document may not have spelled things correctly to begin with. I then tried their Wisconsin records. Hovering produces information which can be copied. I could not find a Civil War pension index card for my 2g grandfather – there is a widow’s pension application and a dependent pension record. It’s a work in progress and perhaps they haven’t gotten to them. You need to check back periodically to see if they have added a database you can use. You can also volunteer to help with the transcribing. Saturday, September 25, the Elkhart Historical Society will hold the final public tours of Historic Elkhart Hill for 2010. The tour includes historical and political sites, Elkhart and Latham cemeteries, and will stop at the Governor Oglesby mausoleum and the Captain Bogardus grave site. For more information see their website at http://www.elkharthistoricalsociety.org. The Elkhart Historical Society presents “What’s in a name?” Mike Starasta, director of the McKinstry Library at Lincoln College, on September 24, 2010. Starasta is an experienced genealogist with expertise on researching archives and using libraries, genealogical websites, genealogical databases and local organizations to develop family trees. Topics include using researching archives, libraries, genealogical web sites, databases and local organizations to find your family history. In addition, Starasta will discuss the genealogy of some of the founding families of Elkhart – Gillett, Shockey, Latham and Oglesby. Reservations are required. Thomas Franklin Lucas was born in what is now Logan County on April 14, 1831. He married Mary Jane Buckles, a daughter of Robert and Mary “Polly” Birks Buckles [and my 4g grandparents], about 1852/53 [records lost in courthouse fire]. Thomas was the son of John T. and Sarah Bowman Lucas [both siblings of my 4g grandparents James and Hannah Bowman Lucas]. 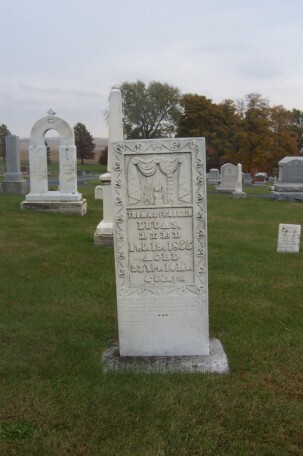 Thomas Franklin Lucas died on February 19, 1855, and was buried at Steenbergen. His widow married as his second wife Abner Copeland, a son of William and Sarah Lucas Copeland, and moved to Iowa and then Missouri. When I asked for probate papers on Thomas Lucas, son of James and Hannah Bowman Lucas, I guess it is not a stretch that I was sent the probate file – or rather a portion of it – for this Thomas Lucas. I find GEDViewer to be better than FamViewer not to mention quite a bit cheaper. It is faster. When I open FamViewer it wants to import my gedcom which takes awhile. When I open GEDViewer it opens to my data. When I had a question Knight responded promptly, not with a canned response but an actual answer. Totally aside, FamViewer comes with a Kennedy family database. GEDViewer comes with a British royals database. I’m a Ricardian so I was delighted to have the British royals database.